Lakshmi Basile performs at the Cosmopolitan Hotel and Restaurant in Old Town. Photo by Mimi Pollack. What is flamenco? Most experts agree that flamenco first appeared in southern Spain in the region of Andalusia where it still flourishes today. Flamenco was created through the fusion of Gypsy, Jewish and Arab cultures in this area. All of these cultures share the fact that they were persecuted at different times throughout Spain’s history. Flamenco was a way to express their stories and feelings. The different styles of flamenco express love, sensuality, injustice, poverty and death from extreme happiness to sadness in both song and dance. Flamenco dancer Lakshmi Basile is an excellent representative of this art form. She oozes sensuality, strength, and emotion as she dances, glides and taps on the wooden dance floor. Her expressive face, feet and hands show her graceful passion for flamenco. Sometimes it seems almost like she is in a trance as the music and her body become one. La Chimi, as she is known in the flamenco world, may have been born in California, but her soul is pure southern Spain. 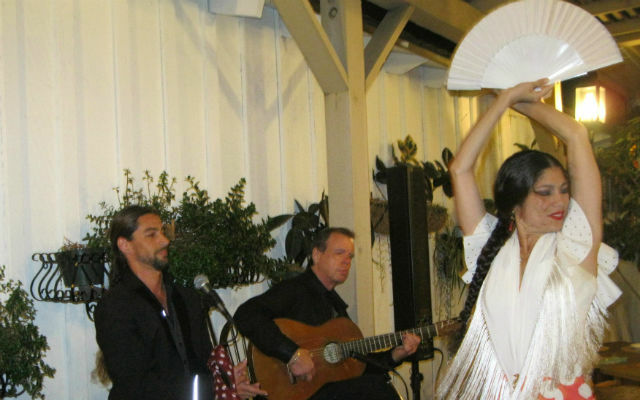 She wants to bring her love of southern Spain and flamenco to San Diego. Basile’s talent in interpreting the many faces of flamenco is on display every Saturday night in November and December at the Cosmopolitan Hotel and Restaurant in Old Town. Her show is divided into three parts, each showcasing different styles of flamenco. She changes into different outfits as well. She is ably accompanied by her partner, flamenco singer and dancer Bruno Serrano, and guitarist Juan Moro. Serrano sings the flamenco “cante” as Basile performs dances known as Guajiras, Alegrias and Tarantos. They also talk about the style and the meanings of the songs and dances. For example, Taranto expresses mourning. The Cosmopolitan Restaurant is offering this show to its diners with no cover charge. It is a good venue for this type of show with its festive and colorful decorations, old Spanish setting, and delicious food. Basile was born and grew up in San Diego. As she says, “I lived a good part of my life here near freeway 94. My family lived in Encanto, which is where I now reside.” Basile was born to an Argentinean/Paraguayan mother and an American father with Czech roots. Both of her parents are artists. Her mother was a dancer/performer who retired to raise her children. Her father is a multi-talented musician/composer who has performed classical music with the San Diego Symphony Orchestra as well as Klezmer/ Gypsy-Roma music with Yale Strom and his band. Her Czech grandfather was known to play Klemzer-Gypsy music in his native country. Her maternal grandmother had a dancing school in Paraguay, so Basile grew up in an artistic and “Gypsy” setting, preparing her for her life’s path. Basile started early she has been dancing professionally since she was 15. At the age of 20, she moved to Spain and honed her craft there for 15 years, earning the name La Chimi for herself as the flamenco dancer. It is hard for a foreigner to break into the world of professional, Spanish flamenco, but she did so successfully and thrived. She has been invited to dance in many places, and recently participated in a flamenco festival in Uruguay. Despite her success in Spain, Basile made the decision to return to San Diego for personal reasons. Dancing flamenco can take its toll on the body as it is very demanding, so she came back to San Diego to heal and be with her family. She hopes to expand the tight knit flamenco community in San Diego and share her talent and passion. Basile’s goal is to expand her opportunities with her own theater productions. She would like to bring in national and international talent in order to have more artistic possibilities when presenting flamenco productions. Her idea is to create higher quality live performances in San Diego for both the flamenco and non-flamenco communities alike. She hopes to become an ambassador for the art of flamenco in San Diego, as well as dance to support charitable projects like Doctors without Borders. Lakshmi Basile’s flamenco performances are scheduled every Saturday night through December from 6:30 p.m. to 9 p.m. at the Cosmopolitan Hotel and Restaurant in Old Town. Mimi Pollack is an English as a Second Language teacher and a freelance writer.